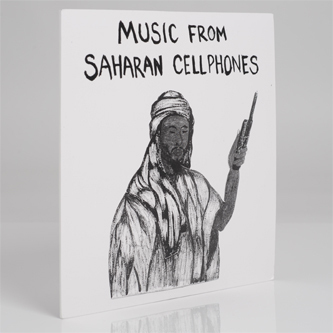 'Music From Saharan Cellphones' serves as both a glimpse into the rich contemporary culture of the Trans-Sahara and a bunch of music you've likely never encountered before, it comprises nine tracks transferred via bluetooth from the mobile phones of residents in Kidal, Northern Mali at the beginning of 2010. Across Western Africa everyone loves playing music thru their phone's loudspeaker - with popular tracks simply spread via bluetooth from person to person, phone to phone, creating a profuse and uncontainable sonic landscape as diverse and transient as the sand ocean "port-towns" themselves. Kidal is one of these metaphorical docks, a major hub in the Saharan network, linking North Africa with Sub Saharan regions and further beyond, and it's also the locus of the record's compiler, Christopher Kirkley's attentions. He collected these tracks at night, swapping mp3s from his own collection for everything from local Tuareg anthems to DIY, auto-tuned HipHop produced on cracked software. We reckon you'll be genuinely surprised and delighted at discoveries like Group Anmataff's melancholy, low-slung Algerian drum machine and guitar groove 'Tinariwen' or the intricate drum programming and microtonal keyboard flourishes of Negib Ould Ngainich's 'Guetna', but best of all has to be the emphatic emotions of Mdou Moctar's swaying autotune ballad 'Tahoultine' or Bayta Ag Bay's forlorn guitar on 'Aicha'. While the irony of these tracks being transferred from mp3 to vinyl shouldn't be lost on you, it's nevertheless a marvellous, beautiful record which has already had The Guardian and The Wire singing its praises, if that makes any difference.